In the second season of the Morgan’s new “rush hour” series celebrated artists perform Baroque to contemporary chamber music in the intimate and sumptuous surroundings of Mr. Morgan's Library. All concerts last approximately one hour. Performing on period instruments, the Diderot, formed in 2012, bring a fresh approach to works of the eighteenth and nineteenth centuries. 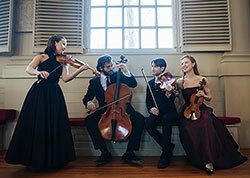 Diderot String Quartet. Photography by Tatiana Daubek.